I don’t know about you but I’ve never spent any time in a desert let alone forty years. However, I have spent time wandering aimlessly following the pot of gold at the end of the rainbow. The LORD never told me to wander aimlessly I did that on my own but little did I know the LORD was asking me to make a choice to either follow him or keep following after the illusive pot of gold. It was in the early 1980’s when I chose to stop focusing on the pot of gold and chose a relationship with God but the hunger of the quick fixes of life (the gold) are still very powerful. 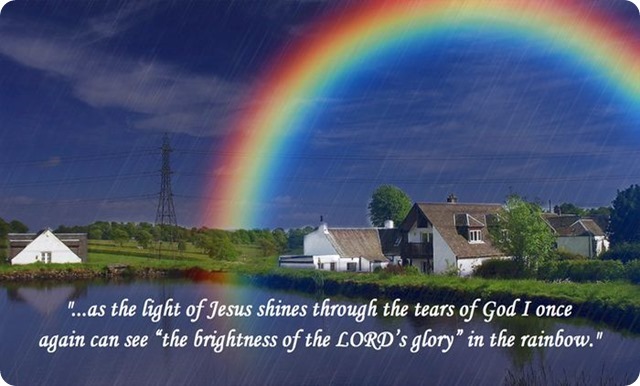 And there are even times when my focus begins to shift back at the pot of quick fixes but then as the light of Jesus shines through the tears of God I once again can see “the brightness of the LORD’s glory” in the rainbow.